Multiple Classic-winning trainer Clive Brittain has announced his intention to retire at the end of the season. 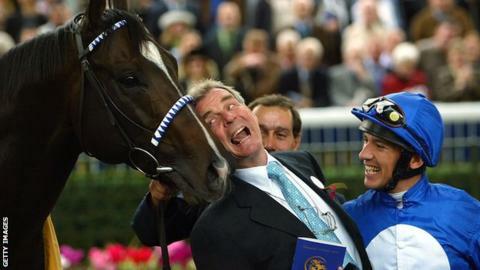 The veteran Newmarket handler, 81, has enjoyed a 43-year career, winning every British Classic at least once apart from the Epsom Derby. He famously sent out Terimon to finish second at 500-1 to Nashwan in 1989. Asked why it was time to call it a day, Brittain, 81, said: "Old age would probably be a hint but I want to spend a few years looking after my wife." Brittain added: "She's spent 60-odd years looking after me, so I think it's only fair I spend some time looking after her. "Where there's a beginning there's an end and I just felt the end was nigh. This is the right time to do it. "I'm retiring with some regret, as I've had some fantastic owners over the years and still have, as well as great staff. I've lived a charmed life." "This is hugely significant for any flat racing fan of the last 40-plus years. "As well as training some outstanding horses - the brilliant fillies Pebbles and User Friendly and Jupiter Island stand out - Brittain is one of the sport's most colourful and best-loved characters. "Famously approachable - "Call me Clive" is his standard response to any query to "Mr Brittain" - he's been renowned for getting his horses on the Newmarket gallops earlier than anyone else and victories were often accompanied by a trademark jig in the winners' circle."